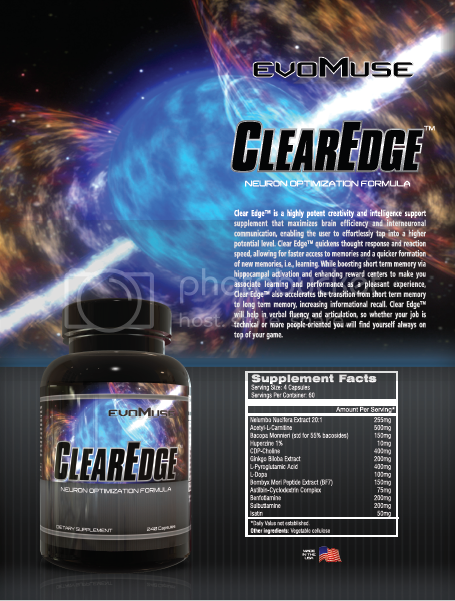 Clear Edge™ is a highly potent creativity and intelligence support supplement that maximizes brain efficiency and interneuronal communication, enabling the user to effortless tap into a higher potential level. Clear Edge™ quickens thought response and reaction speed, allowing for faster access to memories and a quicker formation of new memories ie. learning. Boosting short term memory via hippocampal activation, enhancing reward centers to make you associate learning and performance as a pleasant experience, Clear Edge™ also accelerates the transition from short term memory to long term memory, increasing informational recall. Clear Edge™ will help with verbal fluency and articulation, so whether your job is technical or more people oriented you will find yourself always on top of your game. As I’ve mentioned multiple times over the years, I consider Clear Edge to be my secret weapon. It vastly improves my creativity, memory, speed up my thought processes and increases my articulation of difficult to express concepts. It helps both my research, being able to grasp hold of, sometimes fleeting, flashes of inspiration that turn into products like Epitome and BRITE. I’m able to run with them and knock out a lot of research in a short period of time. Improvement in motivation is also pronounced which is HUGE for a lot of people. If you can’t even get started then you’ll never accomplish anything. Due to some recent discoveries and advances, the product is 100% dialed in to where it’s both effective and economically viable. If anything, I consider this a product that has paid for itself many many times over. Nelumbo Nucifera Extract, Acetyl-L-Carnitine, Huperzine A, Benfotiamine, CDP-Choline, Bacopa Monnieri (55% Bacosides), L-Pyroglutamic acid, L-Dopa, 20:1 Grape Skin/Stem extract, Sulbutiamine, Ginkgo Biloba, BF7, Isatin.